Going back in time becomes easier to imagine when people wear period clothing. At least, that is the idea behind docents in 19th-century dress, enabling them to guide visitors on a fantasy-filled journey to the distant past. Since the Bartow family lived on this property from 1836 to 1888, in theory our docents have many 19th-century fashion options. So why is our costume closet filled with clothing styles from the Civil War era? The answer is that thanks to re-enactors, it is fairly easy to find affordable reproduction clothing from the 1860s. And simple knife-pleated skirts and Garibaldi blouses are a perfect fit for our needs. 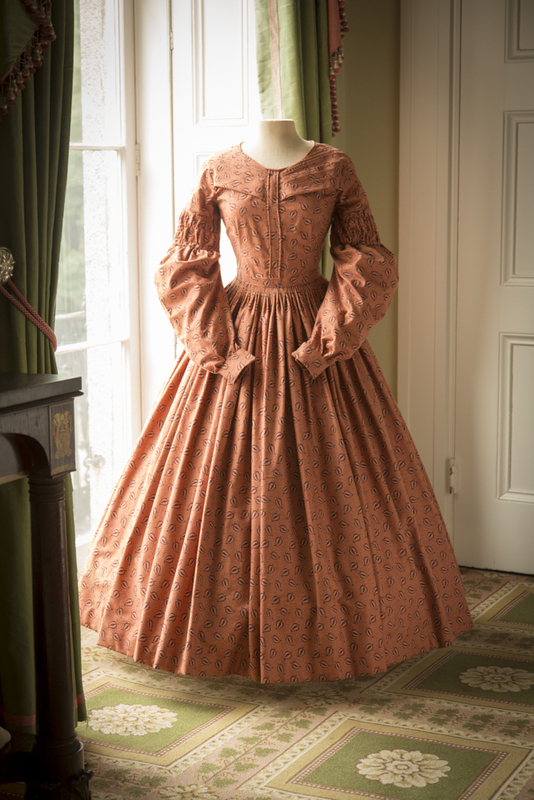 However, inspired by an interest in fashion history, I decided to make my own reproduction dress. My focus was the late 1830s, the period when the Bartow mansion was built. At this time, the huge sleeves of prior years were going out of style. 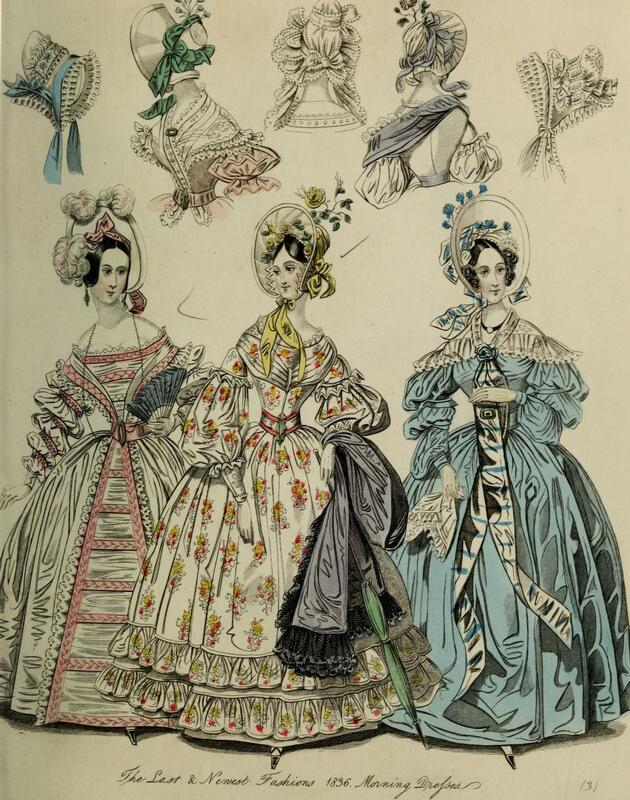 In May 1836, The World of Fashion and Continental Feuilletons, a monthly British magazine, proclaimed that: “The only absolute rule is to flatten the sleeve upon the shoulder, and entirely banish for ever the memory of those enormous balons, which gave to the delicate form of female beauty a breadth apportioned to Holbein’s Dutch women.” This gave the desired drooping effect to the shoulders and sounded good since I did not want to look like a football linebacker. My project started with some research. I studied period sources—fashion plates and paintings—as well as online collection photographs from The Metropolitan Museum of Art’s Costume Institute and the Victoria and Albert Museum. The next step was to find a pattern that was period-accurate. I chose one for an 1837 day dress from a company that creates designs from original patterns or clothing. Finally, I was ready to buy the fabric. 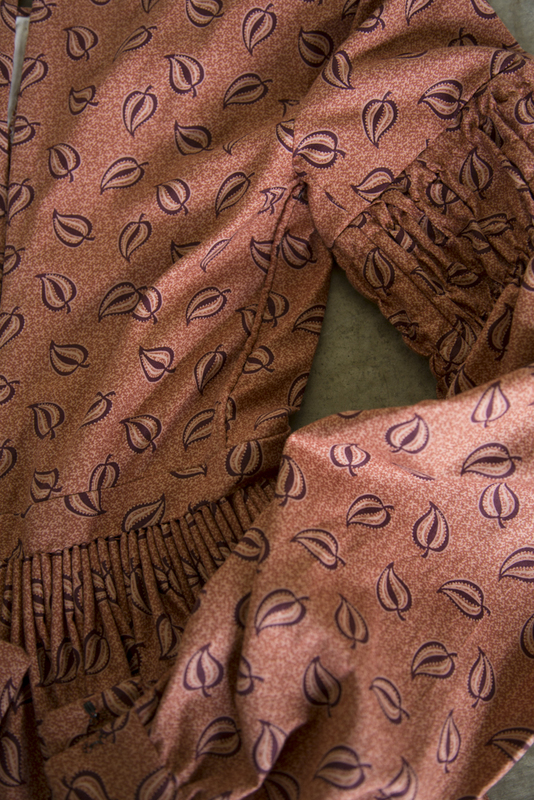 Using photos of dresses in museum collections as a guide, I found some similar patterned cottons, selecting one in shades of rust that was on sale. After getting some muslin for the lining and a few notions, I was ready to start. Was I in my right mind to take on this fairly complicated project, which involved some pretty serious sewing? I would have to make a fitted bodice with difficult pleats, piped seams, and a skirt with hand-sewn cartridge pleats. Although I made a lot of my own clothing from about the ages of 12 to 22, I had sewn very little after that and had never done anything this challenging. It was too late to turn back now, so I dusted off my grandmother’s old black Singer, laid out the pattern pieces, and got to work. Well, dear reader, I found out that a stitch in time does not save nine. I ripped out many seams and corrected more mistakes than I care to remember, but I finally managed to complete my dress. My new frock should be worn with the proper undergarments to create a period silhouette. A corset will smooth the tightly fitted bodice, and several full petticoats will give the skirt a nice full shape and help the cartridge pleats spring out from the waistband. Now I am ready for a journey back in time! Postscript: Shortly after I put the last stitch in the hem, Bartow-Pell was given a similar dress, featuring many of the same elements as the reproduction I had just finished—the narrow front center tab, piped seams, cuffed sleeves gathered tightly at the top of the arm and full below the elbow, and the diagonal bodice treatment. 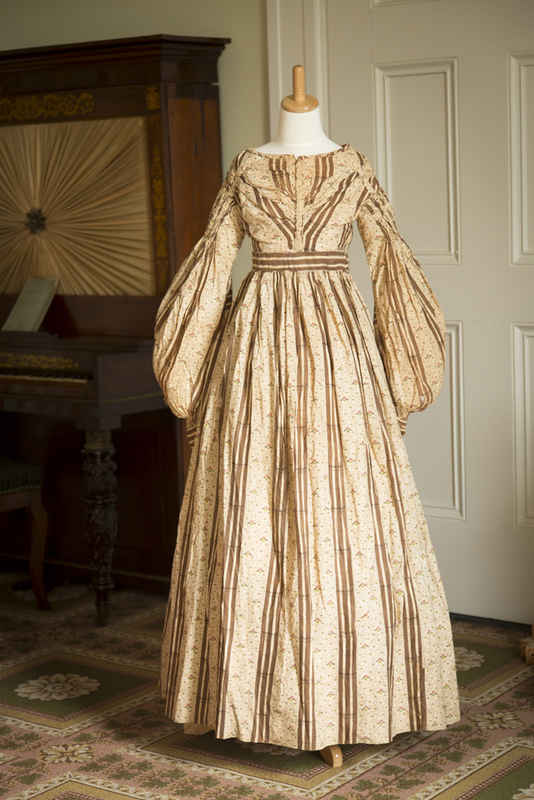 This dress is currently on view in Clarina Bartow’s bedchamber. This entry was posted in Mansion Musings. Bookmark the permalink.